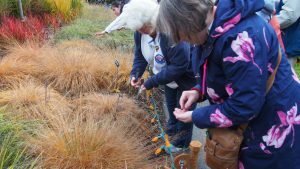 The spirit that, “Every flower of every tomorrow are in the seeds of today” is embodied by VanDusen Botanical Garden’s volunteer Seed Collectors, who are celebrating their 35th Anniversary. Roy Forster, the Garden’s first curator, germinated the idea of having Seed Collectors at the Garden. These days, the Seed Collectors follow a set of protocols established by the Garden’s Curator of Collections, Cynthia Sayre. These guidelines specify how the plant materials are harvested, cleaned and organized. This dedicated group meets twice a week in the Education Centre where a unique seed collection is housed. As John Shinnick, Tuesday’s Chair, expressed, “Its focus is seeds of plants growing within the confines of VanDusen. 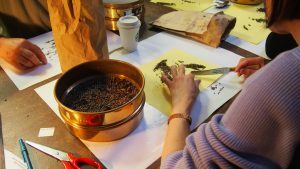 Of note is our collection of native plant seeds.” The distribution of seeds to the public through sales online, in the Garden Shop and at Garden events like Seedy Saturday and the Plant Sale ensures these seeds are available to gardeners locally and further afield. The Sunday group packages and prepares seed for sales and fulfills online orders. These seed sales give home gardeners the opportunity to grow rare plants not available at local garden centres or in seed catalogues. Liz Gosselin, Sunday Co-Chair (with Verna Semotuk) noted that with the exception of the U.S., “We get to share the Garden around the world.” Requests for seeds come from countries such as, Russia, Japan, Sweden, United Kingdom and France. 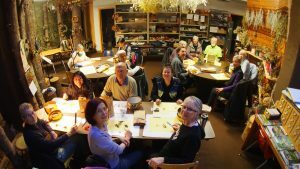 Laughter and fun abounds within the Seed Collectors, as Liz notes, “If you’re looking for a peaceful place to reconnect to nature on a weekly basis, and to learn about plants, trees, and the Garden, this is the group to join. And there are amazing bakers in this group. It’s not all about the seeds.” Thanks to the Seed Collectors from tiny seeds comes great growth.